The IPS-3082GC is a managed redundant ring Ethernet switch with eight 10/100Base-T(X) ports with PoE (P.S.E.) function and two Gigabit combo ports. 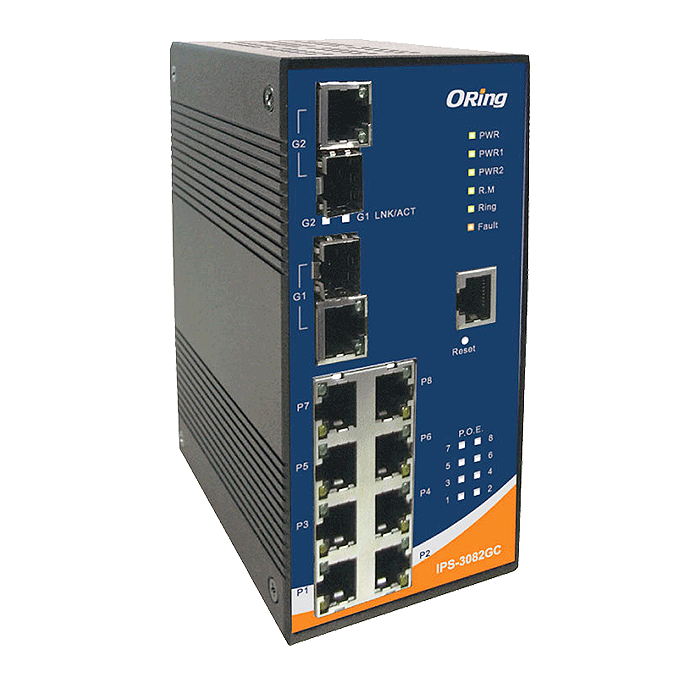 Offering complete Ethernet redundancy protocol, O-Ring (recovery time < 10ms over 250 units of connection), Open-Ring, and MSTP/RSTP/STP (IEEE 802.1s/w/D) all protect mission-critical applications from network interruptions and temporary malfunctions with fast recovery technology. The IPS-3082GC includes Power over Ethernet, a system used to transmit electrical power, along with data, to remote devices over a standard twisted-pair cable in an Ethernet network. The IPS-3082GC offers wide range 24~36VDC power inputs and generates a 48VDC P.S.E. power output per port. The IPS-3082GC features a DDM (Digital Diagnostic Monitoring) function, which instantly monitors the status of electronic voltage, current, and temperature. All functions of the IPS-3082GC can be managed and centralized by a powerful windows utility — Open-Vision. In addition to these attributes, this switch holds wide operating temperature ranges from -40ºC to 70ºC in the harshest operating environments. Therefore, the switch the ideal choice for highly-managed and Fiber Ethernet applications with PoE function. 100/1000Base-X / Fiber Port Indicator Green for port Link/Act.